Sector expert Michael Ballanger discusses the pitfalls of market reversals and forecasting. As I reach end-of-week, end-of-month book-squaring, where all of my urgent e-mails and all of my myopic missives and all of my topical tweets are summarized in once terse and quite concise “Monthly P&L,” I am astounded at the most recent example of how masterfully the Gold Cartel works in suckering investors into a false sense of comfort and misplaced complacency. 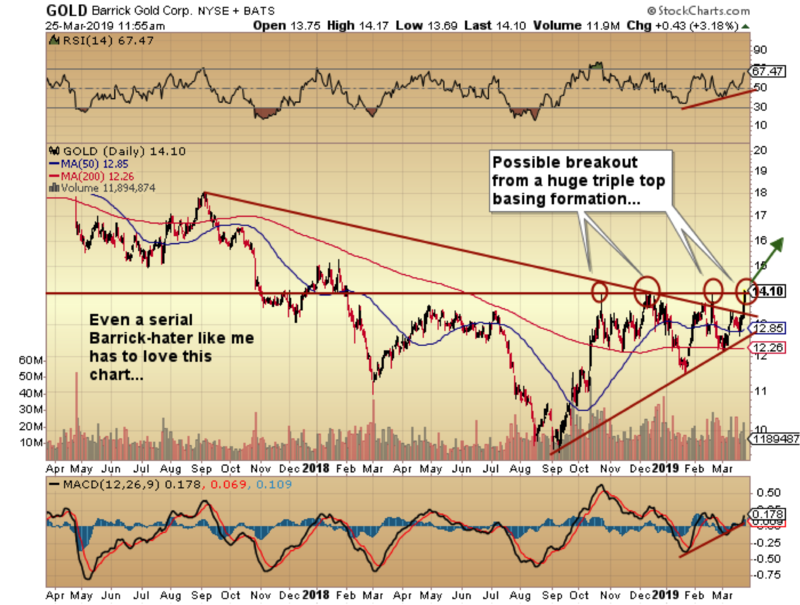 On March 25, just before noon, I sent out the chart of Barrick Gold Corp. (ABX:TSX; GOLD:NYSE) under the title of “New Idea,” with the base case being a technical setup at the $14.00-14.10 level that was shaping up to be a pure, textbook break-out from three prior tops in this range dating back to October. I was buying the May $12 calls for $2.15 (50% position) on the assumption that, despite the “less-than-ideal”buy signal I got on March 6, there was a decent trade in this single stock idea, and a pretty easy shot to the $17-18 area. Well, I did buy the “breakout” story, and it was working beautifully, when I came across one of my old missives from 2016, in which I was shaking my fist and “Tsk! Tsk”-ing all those incredibly naïve fools that were actually of the mind that technical breakouts work in rigged market systems. No better proof exists than the hose job we experienced last week. After I sent out the March 25 note, I watched the stock trade up to $14.54 on the Wednesday opening. But you can see the time stamp on the chart below was 10:08 a.m., and at that time, the RSI (relative strength index) had traded up to 71, placing it squarely in overbought territory. You can also see from the tweet I sent out that I was cautioning the world: It should pull back into the latter part of the week to work off the overbought condition and consolidate. The advice was correct, and after blowing out the May $12 calls at $2.60, GOLD closed down on the day at $13.25, representing an intraday reversal. 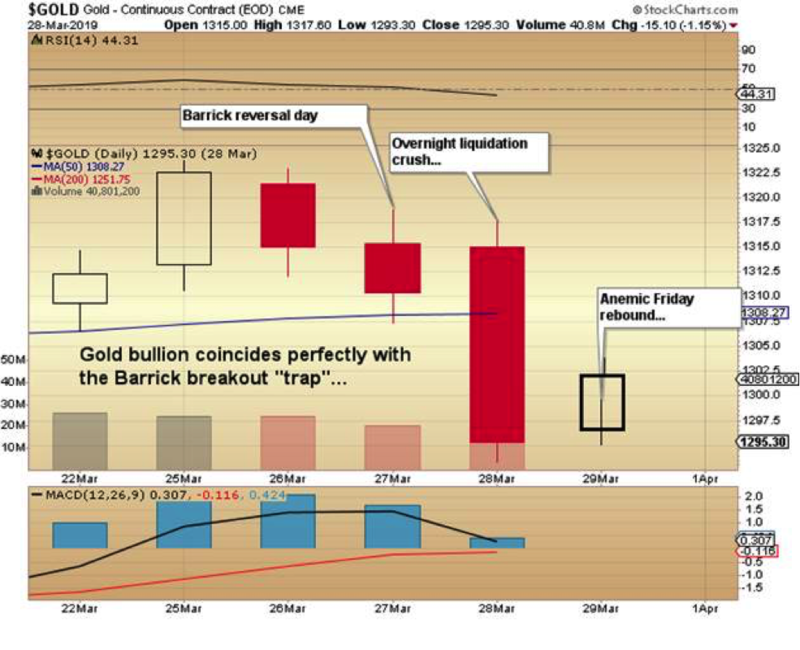 Since GOLD is 10.6% of the GSX, and since NUGT is triple-leveraged GDX, all three were poised for weakness, which came pouring over the dam walls early Thursday morning and in the overnight session, with gold getting smoked by $20 per ounce. 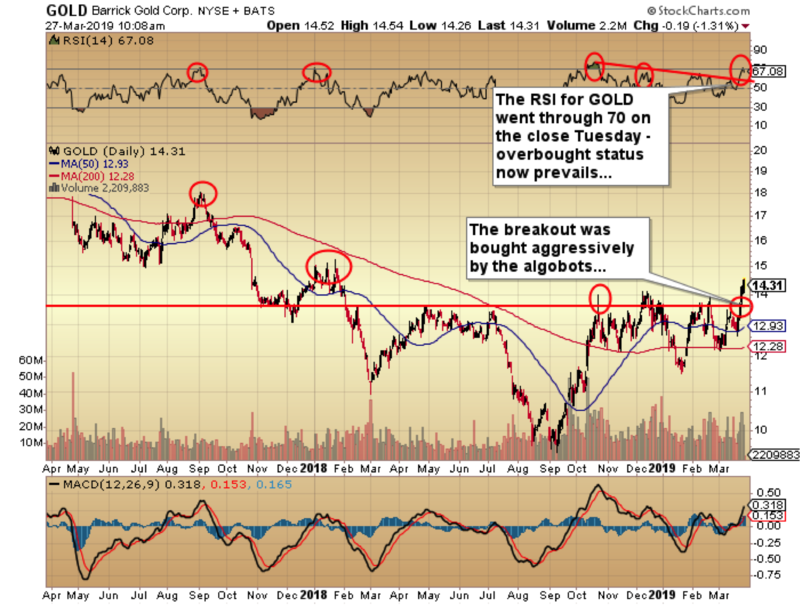 The tweet from Wednesday morningthe reversal day: Should have sent this before the opening but. . .$GOLD was in overbought territory at the Tuesday close and should pull back along with GDX and NUGT. 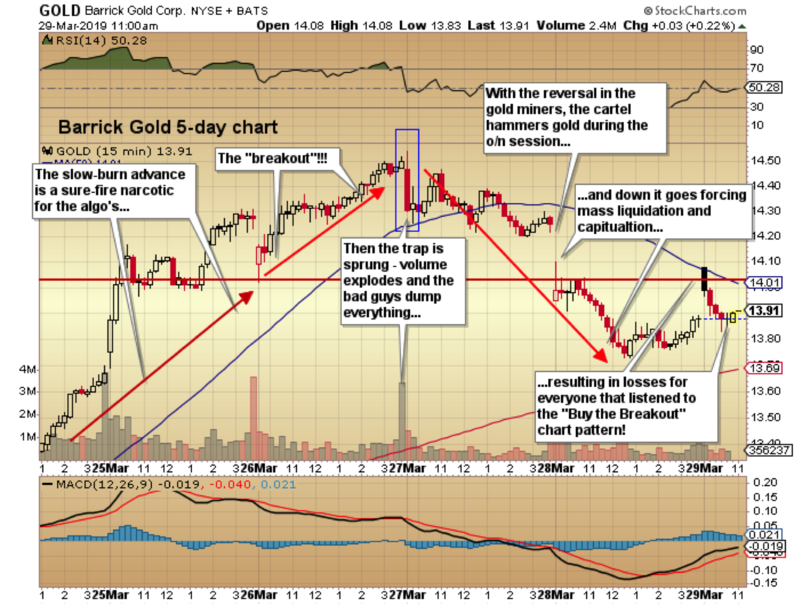 Below is the 5-day chart of both Barrick and June Gold that shows exactly how they created the perfect setup for the managed money systems directed by the algobots. 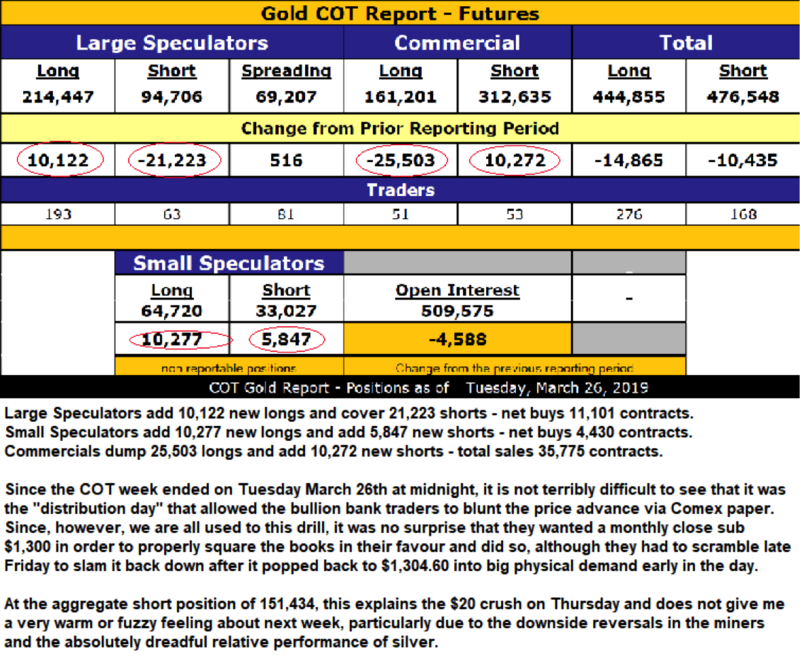 The cartel targeted the heaviest weighting in the GDX ETF (GOLD:US), and purposely created a technical breakout so as to bring to bear massive buyside volume in the overnight trading session on Tuesday. On Wednesday, the stock opened with massive upside volume, and then reversed as the manipulators sprang the trap and sent it down on the day, coinciding with the Comex take-down on Thursday. Technical traders reacting to the contrived snare have now been trapped into losing long positions in what can only be classified as a “failed breakout.” My continuing mantra to “sell breakouts and buy breakdowns!” in the metals and miners is once again proven out, and I vow to never again try to finesse the precious metals markets with the futile fantasy that rigged markets can actually respond in a predictive manner. Total hogwash matched only by its naivety. 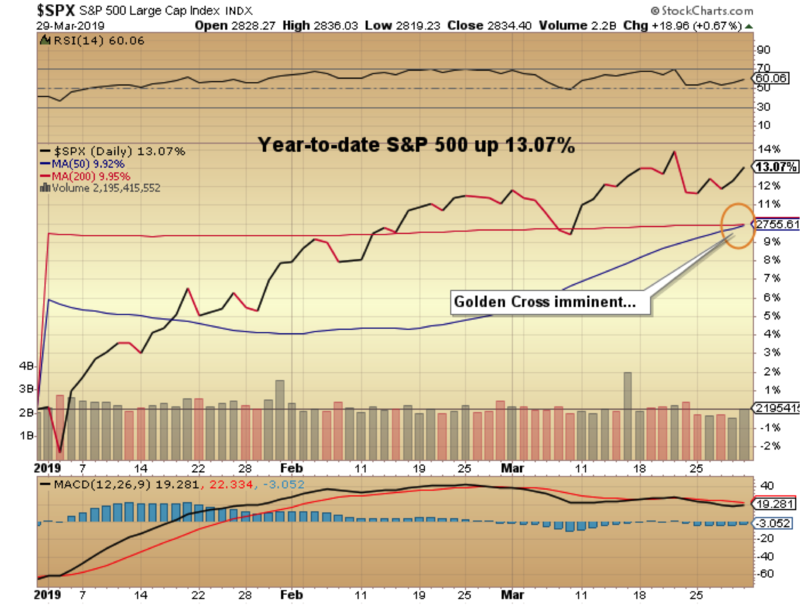 . .
With that as a backdrop, here are two charts that are symptomatic if the title of this missive. 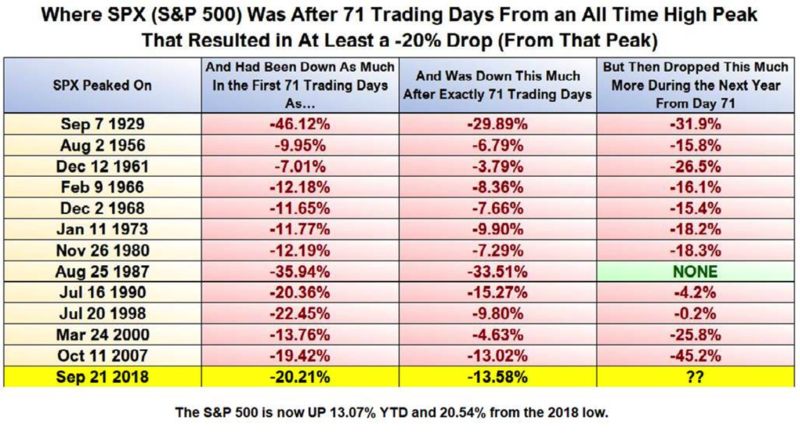 The chart showing what the S&P 500 did “71 days after the bear market arrived” includes data from periods in time before the advent and implementation of government interventions-managed markets. To fight the Fed and the tape is a recipe for disaster, so trying to short the S&P, looking for a retest of the 2018 lows, is certainly going to be an exercise in both braveryand quite possibly stupidity if the Fed’s new “Third Mandate” is successful. The S&P had an RSI approaching the 70s all through February, and is currently residing in the 60s, suggesting that a close next month through 2,860 for the S&P and 26,000 for the Dow Jones Industrials is now my “line in the Sand,” the penetration of which will be a portent of new all-time highs for stocks. I spent all of Friday evening trying desperately to find another cute little anecdote with which to fill out this week’s missive but, alas, nothing of merit comes to mind. I have been busy with the two big fundings (Getchell Gold Corp. [GTCH:CSE] and Western Uranium & Vanadium Corp. [WUC:CSE; WSTRF:OTCQX]), which are always time-consuming exercises. Both are going to be oversubscribed, no small achievement in a market that is still screaming for weed deals and screaming at mining deals (as in “lose my number!”). The spring and summer months will yield substantial news flow from both companies, with GTCH drilling in Nevada and WUC opening the Sunday Mine Complex for sampling and exploration drilling. I can hear the snore of a large Rottweiler at my feet and the sweet aroma of Yorkshire pudding baking in the kitchen, suggesting that all is clear on the metals frontuntil, of course, it isn’t. Originally trained during the inflationary 1970s, Michael Ballanger is a graduate of Saint Louis University where he earned a Bachelor of Science in finance and a Bachelor of Art in marketing before completing post-graduate work at the Wharton School of Finance. With more than 30 years of experience as a junior mining and exploration specialist, as well as a solid background in corporate finance, Ballanger’s adherence to the concept of “Hard Assets” allows him to focus the practice on selecting opportunities in the global resource sector with emphasis on the precious metals exploration and development sector. Ballanger takes great pleasure in visiting mineral properties around the globe in the never-ending hunt for early-stage opportunities. 1) Michael J. Ballanger: I, or members of my immediate household or family, own securities of the following companies mentioned in this article: Getchell Gold Corp. and Western Uranium & Vanadium Corp. My company has a financial relationship with the following companies referred to in this article: Getchell Gold Corp. and Western Uranium & Vanadium Corp. I determined which companies would be included in this article based on my research and understanding of the sector. Additional disclosures are below. 2) The following companies mentioned in this article are billboard sponsors of Streetwise Reports: None. Click here for important disclosures about sponsor fees. As of the date of this article, an affiliate of Streetwise Reports has a consulting relationship with Western Uranium and Vanadium. Please click here for more information. 5) From time to time, Streetwise Reports LLC and its directors, officers, employees or members of their families, as well as persons interviewed for articles and interviews on the site, may have a long or short position in securities mentioned. Directors, officers, employees or members of their immediate families are prohibited from making purchases and/or sales of those securities in the open market or otherwise from the time of the interview or the decision to write an article until three business days after the publication of the interview or article. The foregoing prohibition does not apply to articles that in substance only restate previously published company releases. As of the date of this article, officers and/or employees of Streetwise Reports LLC (including members of their household) own securities of Getchell Gold Corp. and Western Uranium & Vanadium Corp., companies mentioned in this article. Charts courtesy of Michael Ballanger. This letter makes no guarantee or warranty on the accuracy or completeness of the data provided. Nothing contained herein is intended or shall be deemed to be investment advice, implied or otherwise. This letter represents my views and replicates trades that I am making but nothing more than that. Always consult your registered advisor to assist you with your investments. I accept no liability for any loss arising from the use of the data contained on this letter. Options and junior mining stocks contain a high level of risk that may result in the loss of part or all invested capital and therefore are suitable for experienced and professional investors and traders only. One should be familiar with the risks involved in junior mining and options trading and we recommend consulting a financial adviser if you feel you do not understand the risks involved.